A look at the Portland newspapers from the mid-1800s reveal a very different idea of what was considered "State News". This column was filled with descriptions of accidental death, gossip, and proclaimations about the insanity of the deceased. While in the present day newspapers, details of death or personal information are politely couched in more palatable language, that was not the case in the 1800s. Here are a some dastardly items that appeared in the State News column of the Daily Eastern Argus newspaper during the years 1865 and 1875. Over at All Things Maine, Chris D reports that a Maine landowner is contemplating a very pleasant sounding alternative cemetery as use for her property in South Orrington. As of this morning, the article in the Portland Press Herald has generated 16 comments of various levels of response, from encouragement to vehement airing of opinions about "dead human shells" and land use. John of Portland said, "The thought of becoming wormfood is making me drool...BRING ON THE DECAY!!!!" Lisa of Hollis said, "I think the idea of any cemetary is absurd. Look at the earth and see just how little land is suitable for the growing of food that feeds the humans that insist on reproducing like rats. Where are these people supposed to live in the future? They can't build homes on the "sacred" land occupied by human waste that was left behind by ancestors they never even knew. What are we saving these bodies for? Wont we eventually run out of prime real estate to store them in after a while?" Rod of Augusta said, "I always wanted to be forest fertilizer. I don't think it matters to the dead." Here here. I think I'm with Rod. At any rate, this certainly pegs a clientele that is attracted to Maine in the first place -- folks that love the natural world and the peace it seems to bring, and people who are interested in doing as little harm to the land as is possible. Whether the burial costs stay reasonable remains to be seen as Ellen Hills works out a proposal for the business plan with the Funeral Consumers Alliance of Maine. Back in 1996, Memorial Ecosystems opened Ramsey Creek Preserve, the first U.S. green burial ground, and their burial costs seem to have remained fairly reasonable in the high-priced world of funeral arrangements. For more information, please see also the Green Burial Council's site. 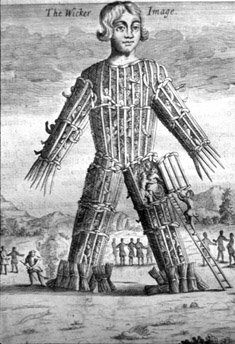 Back in January, Chris D reported on the new remake of the famous "Wicker Man" movie, which is placed in Maine (although filmed in Vancouver). For those of you feeling out of the loop, it stars Nicholas Cage as a rosary and self-help tape bearing investigator who is allergic to bees (this will make only slightly more sense as the article goes on), and Ellen Burstyn as the leader of the now-matriarchal pagan society on the island. A September article in The Scotsman reveals more controversy than usual surrounding the remake. Some of the complaints include those from Robin Hardy, the director of the 1972 original, whose name was bandied about in a deluge of publicity material put out by the new production claiming him as their writer, when he has nothing to do with the new script at all. A SWARM OF KILLER BEES! Yes folks, if you feel your movie needs more oomph, just send these sweeties in. Phhh! Will Wicker Man fever sweep Maine, despite the film's abject snubbing of us for use as an actual location? Already there is a band which has renamed itself the Wicker Man (formerly Here Be Dragons). 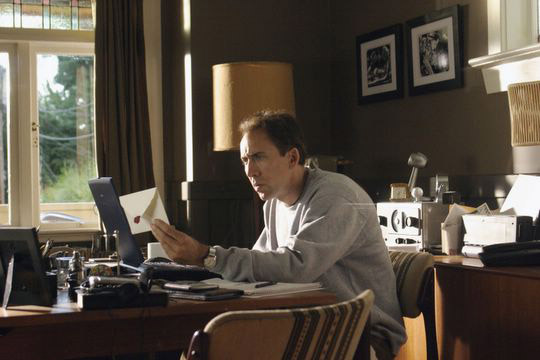 Nicholas Cage was very pleased to play his part in the remake, because the original disturbed him greatly when he first saw it, and the impressions from the film lasted for weeks. He was introduced to the film by his friend, the late Johnny Ramone. (Source) Please note how confused he looks in this photo. This should allow moviegoers a sense of identification with his character as they too will most likely be terribly confused all through the movie. Local pagans have been heard to say, "They never will get the details right, will they? For one thing, it's volcanos where we throw virgins, not Wicker Men, and for another, it's virgin MEN, not young girls. And where's the giant crocodile? There is supposed to be a giant crocodile! Some anthropologists they are..."
The Boston Globe has printed a good interview with Maine cryptozoologist Loren Coleman in its Magazine this Sunday. Coleman discusses the 20% of mysterious animal sightings that cannot be explained away -- the thing that keeps him going and keeps the lure of mystery strong. He also discusses his day job as a consultant at the Maine Youth Suicide Program, giving us a little seen glimpse of his everyday life. The piece also features a masterful photographic portrait of Coleman by Tanit Sakakini, taken for the Globe. In addition, Binnall of America has just posted over 100 minutes of interview audio with Coleman, available as MP3, podcasts, or streaming audio. 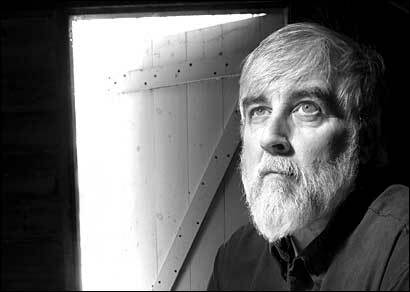 This interview runs the gamut from Bigfoot to Chupacabra to suicide, predictions for 2006, to the background that drives Coleman in his studies. A 'Tremors' Sequel Filming in Maine? There's an AP story out today reporting mysterious events in Somerset County. House-shaking tremors were felt in Solon last week, and "in a 15-mile radius in Anson, Madison, Skowhegan and Norridgewock" a few days ago. It's been established that they weren't caused by earthquakes, quarry blasting, or Dumpsters falling off the back of trucks. Says County Emergency Management Director Robert Higgins, "It's just unexplainable, I guess." Good heavens, I do believe this is the strangest looking carrot I've ever seen. 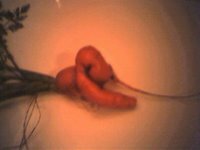 Dug out of Chad Allen's garden in Maine, 2005. Kittery... ahhh Kittery. Who knew you were home to such weirdness? The Gentle Wind Project, professing to be a beneficient organization fueled by Spirit World inspiration and energies, sells their "healing instruments" for a pretty penny. If you would like to see what is really inside one of their "instruments," there is a very nicely done concise expose of them by Dave Touretzky that will prove very educational. Mr. Touretzky thinks they look rather like hockey pucks, and whereas he has handled one and I've only seen photos you may find him a more reliable source, but gosh, they sure look like paperweights to me. However, Gentle Wind's site refers to them literally as "Healing Pucks," so I am shown to be misguided. Please note that, according to Gentle Wind's website, "The Instruments are organized from least to most expensive with such factors as level of involvement, support for this project and affordability defining their ultimate donation amount. All Instruments are completely effective for most people but NOT everyone. However, the Advanced Instruments requiring a higher donation also consume much greater research, development, design and manufacturing costs. That extra investment of time and energy translates into Advanced Instruments capable of penetrating deeper into the human auric structure and physical energetic system. All Instruments can be upgraded and are guaranteed to work for at least 3 years. " Wow, great, I was worried my paperweight was going to become obsolete and outmoded. Please note that the actual price of the instruments is no longer shown directly on the website. Another interesting point made by the site is that "clinical trials have been done and some of the results are on the Comments page of this website. In a few cases clinical trials were terminated because the investigators were overwhelmingly satisfied with the effectiveness of our technology and did not wish to deprive the control groups of the relief they found immediately with the experimental groups." I'm sure that every scientific study should be so lucky as to allow humane interests to interfere with the actual completion of proofs necessary to promulgate their findings in the scientific society at large. 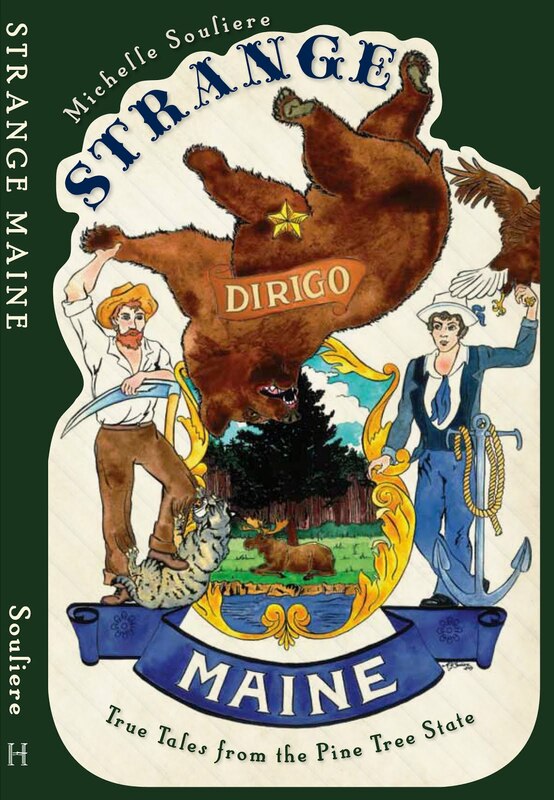 Whew, folks -- chalk another one up for the strangeness of Maine! For more information, please see the High Weirdness page about this whole shebang. Was Hannibal Hamlin a Zombie? I can't confirm this story, but when I was a kid in Oxford County (in the next town over from Hamlin's hometown of Paris) I did hear one story about the Vice President. When he was an infant, he became ill and the local Abenaki healer, Mollyockett, was called in to consult. She administered a native remedy that saved the boy's life, giving him the chance to grow up and become zombified. Mollyockett was not a woman you'd want to cross. While passing by Snow's Falls in Paris during a storm, she stopped at a house there and asked for shelter. When she was refused, she laid a curse on the dwelling. The location has been cursed ever since, and even within my memory has been plagued by flood, fire and failure. 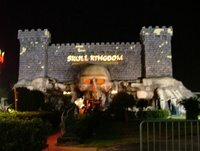 The businesses that try to set up shop there are doomed to fail, but the current occupants have evidently embraced the site's history. If anyone cares to take the risk, it's situated on Route 26 in West Paris, just above the Snow Falls rest area. Weirdness by Request -- Now Available! Join the fun as Mr. Freeman goes to Europe, and invokes his Law-Giver Wonka status, implementing Ape Law back at the office, including but not limited to: construction of an underground chocolate river with cheese quicksand pit at the end, Little Lord Fauntleroy Fop Friday, Bigfoot fight betting rings, wig wearing policy, the import of monkey parts for Wonka Monkey Powder development, the opening of a ZU hokeypokey, and many more unbelievable things. Trust us. In other news: brain is broken. Must quit job. have had Shoggoth on the Roof songs stuck in my head for two days now, including "ishy ishy fish" and "blub blub blub blub bloody bloody blub" lyrics from "If I Were a Deep One." very much wish to be at home watching "Clue" right now, or in studio making crazy art. More as events warrant. 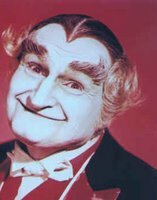 While on the topic of dearly departeds, I would be remiss to mention the passing on February 3rd of Al Lewis, a.k.a. Grandpa Munster. As posted in Chris D's All Things Maine, Al Lewis had substantial historic Maine connections, and spent a lot of time in Augusta as a high school basketball scout back in the day. Sad news passed quickly through the grapevine Monday night, as we received word of the death of Geno D’Alessandro Sr., owner of Geno's. Over the years, Geno's lurked on Brown Street until recent gentrification of the area forced it out. Located now where The Skinny once was, and predominantly run by Geno's son JR, Geno's stands today as a veteran of the Portland underground world, and the longest standing music establishment of its type in Portland. Geno provided the facilities for Portland music to get as strange as it could be. Most of the time, he had a good sense of humor (except perhaps for the time when he was recovering from one of his horses kicking him in the chest back in the late 80s). At The Hive, we are glad that Geno got so much recognition this past year as he moved the location of his historic club, and was introduced as a prominent personality of Portland to so many more people before his passing. Here's to a Portland Legend -- long may his memory live on. More info is available at The Bollard. 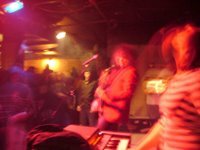 Photo by Michelle Souliere at last show in Geno's old location on Brown Street, March 2005. Pontiffs shown playing. Spotted on the road around Gorham/Standish-- a large plexiglass cow painted up like Captain America, being hauled on the back of a truck. Well, I was poking around for strange Maine stuff as I always do, and ran across this very interesting bit on Matt LeClair's blog in mid-2005, and thought I'd share it with you kind folks. It has some interesting observations on Lands North of Portland. May this also serve as notice (appropriately?) that The West End News is now online at thewestendnews.blogspot.com. Look Ma! We've got a new neighbor! Now if Strange Maine and WENews can start trading stories, we'll be having some good winter fun, I tell ya. 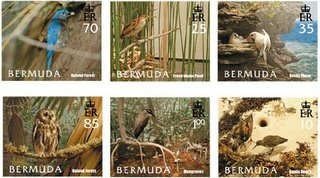 Well, leaving aside the escaped pet birds such as the small blue parakeet that was flying around my old Brackett Street apartment several years ago, Maine has few occurrences of tropical birds. One such instance followed The Great New England Hurricane of September 21, 1938, a few days after which "a specimen of Phaethon lepturus catesbyi was found at East Winn, Penobscot County, Maine, about seventy miles inland." Bermuda’s Rocky Shores would not be the same without the White-tailed Tropicbird (Phaethon lepturus catesbyi). Locally called Longtail, this ‘harbinger of spring’ arrives in March to perform spectacular aerobatic courtship displays, and eventually to rear a single chick in cliff crevices, high above the tides. Both parents and offspring leave by October to spend the winter on the open Sargasso Sea where they feed mostly on squid. The event was documented in the April 1943 issue of the Auk, a natural history magazine of the day, by Arthur H. Norton, of the long defunct Portland Society of Natural History. Mr. Norton objectively explains his theories on how the bird was "driven before the gale to its doom," and remarks, "This appears to be the first instance in which this bird has been noted in Maine." 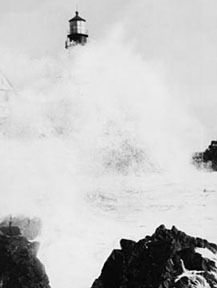 For your further enjoyment, I present a photo of Portland Head Light during the 1938 storm backwash from the historic hurricane (known in some quarters rather flippantly as the Long Island Express). In February 1972 Coast Guardsman Robert Allen reported to the Maine Sunday Telegram that a storm had torn the 2,000 pound fog bell from its house, ripped 80 feet of steel fence out of concrete and left the house a "foot deep in mud and flotsam, including starfish." A wave had broken a window in the house 25 feet high. Another good Portland Head Light site I found is about the history of the Strout family as paired with the Head Light for over a century, in an account by John Strout on the Lighthouse Digest site. It is a tale of shipwrecks, watchfulness, foghorns, a flower garden, and lots of painting over the years. Brian Bouchard at EarlyMaine.org posted a link last week to a list of 21 executions that occurred in Maine between 1644 and 1885. My own great-great-grandfather was present at two of these events—the hangings of Peter Williams and Abraham Cox. They had been convicted of murdering the captain, mates, and one other man aboard the brig Albion Cooper. The execution happened in the prison yard in Auburn, at eleven o'clock on the morning of August 27, 1858 (not 1860, as the list states), and was witnessed by 6,000 to 7,000 people, "of whom it is estimated that one quarter were women" [Kennebec Weekly Journal, Sept. 3, 1858]. My great-great-grandfather, Lemuel Dunham, had turned 28 the day before, and came down from Hebron Academy to witness the hangings. "I saw those poor wretches launched into eternity," he would later write, "and it was a sight that I do not wish to witness again” [Oxford County Advertiser, Sept. 5, 1884]. The executioner was William K. Kimball of Paris, who subsequently committed suicide with a pistol. Coincidentally, a second man from my hometown of Greenwood—Octavus K. Yates—also played a part in the spectacle. He wrote a poem (actually lyrics, to be sung to the same tune as "Old Ironsides"). 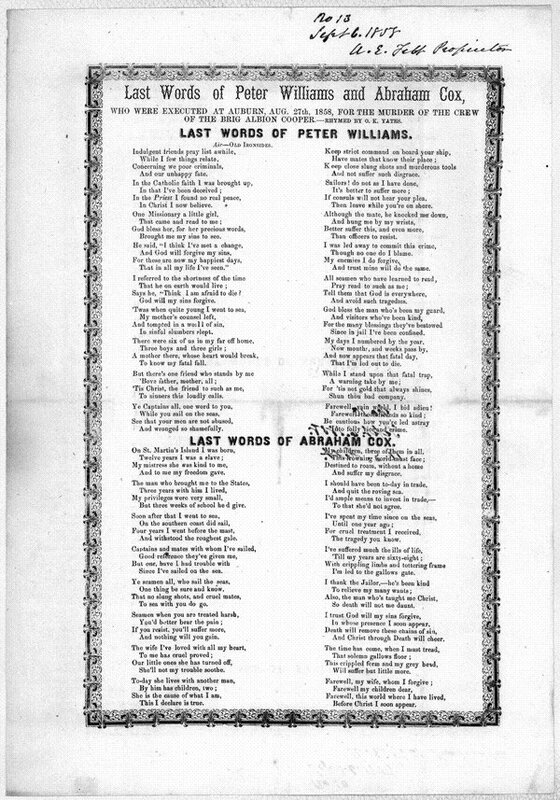 This he cleverly titled "Last words of Peter Williams and Abraham Cox, who were executed at Auburn, Aug. 27th, 1858, for the murder of the crew of the Brig Albion Cooper." 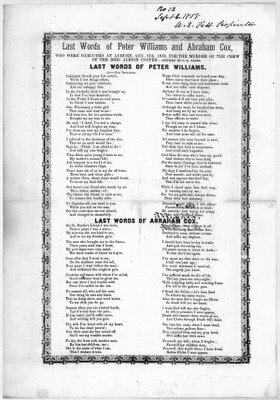 A copy of his broadside now sits in the Library of Congress. In a strange twist of fate, a small group of Portlanders who ventured south to the wilds of Worcester, Massachusetts for the Rock and Shock Horror Convention/Music Festival back in October 2005 met an octopus in grisly battle. He was ferocious I tell you!!! The rampaging beastie was eventually subdued and subjected to a humiliating trophy photo shoot, which remains our only record of this strange historic event. Now christened Eugene Lovey (after H.P. Lovecraft), the octopod dwells at The Hive with us, where he lurks on the wall over our bed, after having been presented as a most glorious wedding gift. 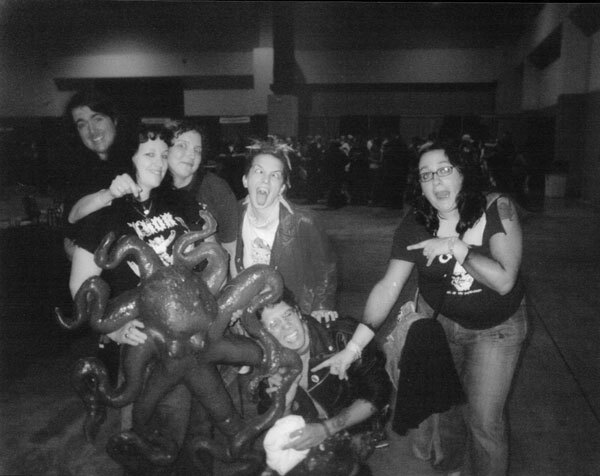 Tristan, Salli, Michelle, Lisa, Greg (below), and Peri (who named the beast). In perhaps an even stranger twist of the tale, Tristan and I visited his original intended home, Skull Kingdom, while on our honeymoon excursion in Orlando Florida.